P yrite is one of the most widely distributed of sulphide minerals, occurring in a variety of environments. It is present in igneous rocks as an accessory mineral. It is a common mineral in hydrothermal sulphide veins, in replacement deposits and in contact metamorphic deposits. Fossils are often replaced by pyrite. The name comes from the Greek word for fire and alludes to the sparks given off when the mineral is struck sharply. It has been used as a talisman for health and warmth since ancient times. Pyrite has a very strong powerful male yang energy that will induce intellectual superiority when worn or carried. It is ideal for students and those who wish to improve their academic prowess and memory. It is also ideal for those people who feel subordinate to others or who have an over-abundance of the female yin vibration. It can make those who are very male or yang act almost too aggressively, so they need to be aware of its potency, being conscious at all times to use this mineral in a balanced holistic way. Pyrite is totally focused and will act like a swift arrow going straight to the physical, mental or emotional disease. There it will facilitate healing but, more than this, it will also make you aware of the cause of the illness or disease and bring about favourable circumstances to find ‘cures’ for the ‘cause’ of the dis-ease. 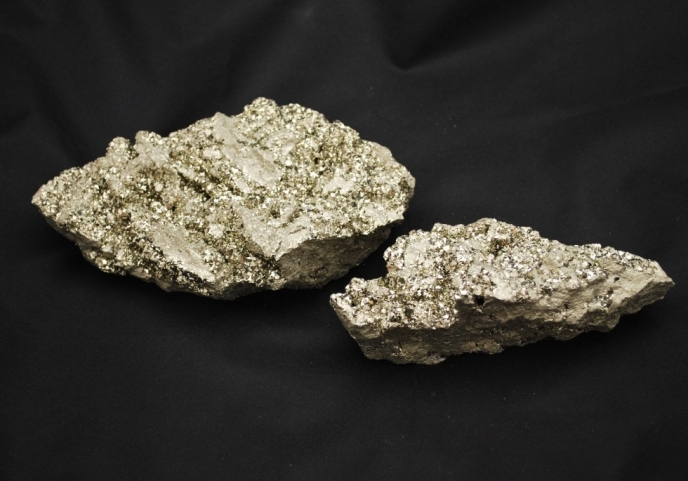 This process is facilitated by a synergy of the higher self and the improved concentrated mind action of the pyrite mineral as it interacts with your energy field. It will swiftly dispel deep gloom; lift despondency, despair and the drudge mentality. It is also ideal when you feel a severe lack of energy. It is a must for those who display tendencies of low self-worth and subservience. Pyrite teaches you to honour and accept yourself, to work towards self-empowerment, personal freedom and joy. Pyrite is a very protective stone and will keep your energy field clear of unwanted outside influences. It will stop energy leaks and energy drains from the physical body and auric shell. It will strengthen the meridian system. It is not recommended to be worn as a pendant, as it will irritate the skin, but you could carry it in a ‘medicine’ pouch or use it for meditation. Affirmation: I accept and honour myself exactly as I am.